Between 1914 and 1950, Ellen ­Shipman (1869-1950) designed more than 600 gardens in the U.S. Her secluded, lush formal gardens attracted a clientele that included Fords, Edisons, Astors and du Ponts. Shipman’s imaginative approach merged elements of the Colonial Revival and Arts and Crafts movements with a unique planting style enlivened by Impressionistic washes of color. 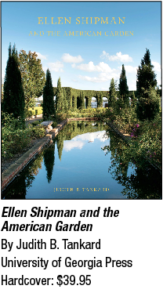 Ellen Shipman and the American Garden, being released April 15 by the University of Georgia Press, describes Shipman’s life and discusses her major works, including the Cummer Museum of Art and Gardens in Jacksonville, Florida; Stan Hywet Hall and Gardens in Akron, Ohio; Longue Vue House and Gardens in New Orleans; and Sarah P. Duke Gardens at Duke University. designers in other parts of the U.S.